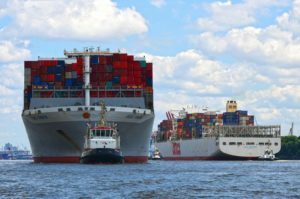 Chinese consortium to build new container terminal in Hamburg? Hamburg port community strongly opposes the results of the 5-months international ideas competition initiated in January 2017 by the Hamburg Port Authority (HPA) with the view to develop the 42-hectare area Steinwerder-Süd. The competition has been won by China Communications Construction Company (CCCC) with the project to construct a container terminal in that central port area. The area offered by HPA for the market consultation process includes 1,100 meters of quay wall with three berths for large vessels as well as the production of terminal space at Oderhafen and new water areas as manoeuvring space. The participants were to submit their “realistic and future-oriented development concepts” supplied with costs, funding and timing of the projects as well as the conditions under which the private service providers can operate the area. Upon assessment of the submitted concepts, HPA plans to integrate the result into the comprehensive port planning and to determine the future operator or investor in the course of the Europe-wide award procedure. As it has recently become known to The Loadstar, the port authority has awarded the competition to CCCC, a Chinese construction conglomerate, although no official press release has been published neither by HPA nor by CCCC. The Chinese company submitted the turnkey project of a new container terminal at Steinwerder. This has caused a storm among the Hamburg port operators and shipping community. The Hamburg port employers’ association, UVHH, described the decision as “incomprehensible”, as HPA’s own port development plan had estimated that “existing terminals and their projected expansion programmes are able to cope with forecast volumes up to 2025 and beyond”, said UVHH’s President Gunther Bonz (Eurogate). According to him, Hamburg port does not need another container terminal, but should make the area available for industrial use with associated storage and ship capabilities. Second place in the ideas competition went to the C Steinweg Group, with a proposal to develop a shortsea terminal at the site. CCCC was founded in 2006 with the headquarters in Beijing. It is listed at the Hong Kong Stock Exchange and is one of the 500 largest companies in the world, with investors including Chinese internet billionaire Jack Ma, founder of Alibaba. It is the parent company of ZPMC, the global market leader in container gantry cranes manufacturing.